Congratulations to us on making our 3rd year anniversary! Still to this day, he makes my worries go away. When I’m with him, I can only think of the moment and nothing else. We are still traveling, laughing at stupid things, experiencing new adventures, and having late night talks and flirts. To celebrate three years of bliss, we decided to have another travel date. We gifted ourselves tickets to Lightning in a Bottle at the end of May. Lightning in a Bottle isn’t your average music festival. They have workshops in the morning which we will be participating in. There is so much I wanna do! Yoga, hoop and poi workshops, glass blowing, etc etc. Trust that it will be a busy/rewarding weekend. Our friend, Sonia, invited us a few months back, and we were unsure until we saw the line-up. The headliner announced was none other than our favorite Burning Man DJ, Bassnectar! We purchased our tickets right away and connected with Sonia who is camping at the event. She is one of the sweetest girls I met recently, and we’re very excited to join her for some festival fun. We were lucky enough to be able to join her camp, but we’re clueless on the tent camping experience. Thanks to google, I found an extensive outdoor festival camping checklist. The list is complete with a beach towel for relaxing, a watch to check for set times, and hula hoops, poi, and yoga mats. 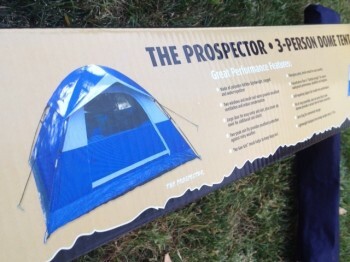 Since we’ve never camped before, we had to shop for some of your basic camping materials like…a tent. We found ours at Big 5 Sporting Goods for a reasonable price. It is a 3 person tent and is small enough to be snug and big enough for us to sleep in with all our camping gear. Now, to test Ray’s skills at building the tent since he’s never built one before. He built it in no time! It was quick and painless. Check out our cute, little tent! I’m so happy and proud that we own one now! The rest of the checklist seems pretty easy to get. The only issue I have is food. We are going to be arriving at the event on Friday afternoon and leaving late on Sunday. I’m the kind of person that definitely needs to have a real meal at least once a day! I’m worried that this won’t happen when we’re there. Campfires are not allowed for safety reasons and trailmix won’t be enough. I’m not sure if there will be food vendors there, but I still wanna bring our own food just in case. Planning for this seems tough, but it needs to happen. I need to plan for 2 breakfasts, 3 lunches, and 2 dinners. I’m thinking of buying some butter croissants for breakfast and locking them in ziplock bags to stay fresh. Maybe bring some sandwhiches for the first day. I’m not so sure what to do about the rest of the weekend, so I would like to ask the experienced campers out there. What do you do about meals when you go out camping? Any suggestions on what we should do? Anything would help! Wish us luck on our first time camping at a festival! I hope to see some of you there! They have vegan & vegetarian vendors!! BUT I would say stop at Target or Kmart and pick up some disposable, one time use, mini bbqs. they work amazingly at festivals bc you can cook a full meal and pour water on the top ans toss it in the trash when youre done! Bring food and just keep it on ice! :) yayyy 7 days until LIB! Ahh I’m jealous you guys are going to LIB!! I’m sure it will be a great time :). When Cheryl and I went to Coachella, we went to Trader Joes and picked up some spicy Chile Tortillas. Then headed to Sprouts to get pre-packed deli meat and Cheese. With a little mayo and mustard, it was delicious and cheap. We also had the goods to make PB&Js and Tangelos from sprouts were the best snack. It was perfect for the hot weather. I don’t have much, but I hope this helps. Congratulations to you both on 3 years!! Have an amazing time. Thanks, Shirley! All kinds of sandwhiches will be packed that weekend! Spicy Chile Tortillas? Intriguing…I hope you guys had fun at coachella! What I usually do when I go camping, is to first assess what I CAN do. so since you can’t have a campfire, I assume cooking will be limited to camping stoves, which these days are pretty cheap. They make fairly good 2 burner camping stoves that take small cans of propane. just bring a pot and either pre-cook your food for the days you will be out there, or bring easy to cook food (like canned foods) and cook that way. You want to avoid cooking things from scratch as it will not only waste time, but it doesn’t always turn out like you imagine. freeze dried food is good and quick if you have the correct liquids to add to it (milk/butter/water is usually the basis or most freeze dried meals) and they actually taste pretty good. ramen or anything with noodles would also be an easy thing to make. I’m going camping for 5 days at the end of may so I will be preparing most of the food ahead of time and bringing canned or cold foods that don’t need to be cooked. in any case, good luck and have fun! hope this helps! 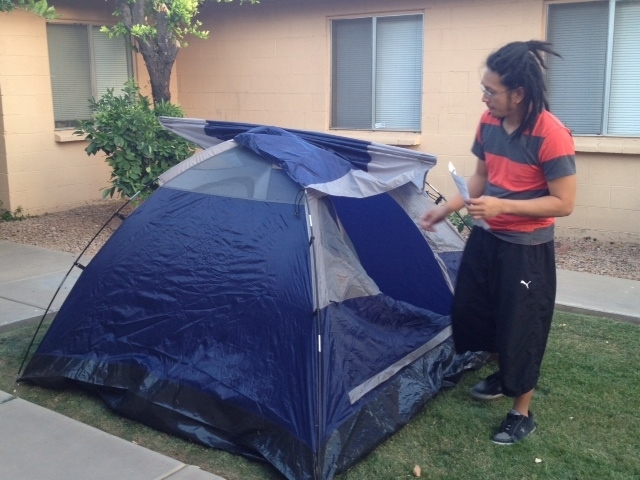 Ooh…camping master! Canned foods seem like a great idea. Propane stoves are allowed, but we’re not sure about bringing one, yet. We will have to look into freeze dried foods, but we won’t have a freezer to store them! How do we deal with that? Have fun on your camping trip! and thanks for the help! Freeze Dried food is just the process of drying/dehydrating food. it isn’t meant to be stored in the freezer or be kept cold, just the process of removing all the water from food. just add water and cook and it will come back to life. this image shows a freeze-dried meal of spaghetti and meatballs, designed for campers: On the left is the dried version; on the right is the rehydrated version. Food vendors will be there! It’s definitely fun to explore some of the available. You can find the hippest, rawest, meals ever. However, it can be pricey. I’m bringing a cooler with my essentials; hummus, salsa, apples, yogurt, nuts, etc. Also, LIB will have ice for sale to keep your yummies cool. We’re probably gonna buy food from the vendors on Saturday night and Sunday. We’re afraid that any food we bring might go bad by then! Good idea on fruits though. Hummus sounds delicious!